ABOUT/CONTACT US / NEWSLETTER / PT TOURS . 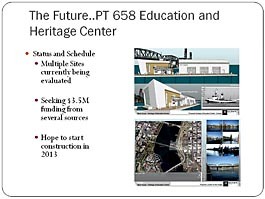 . .
was established in July of 1995 as a non-profit 501(c)(3) organization, formed by a group of gray-haired ex-PT boaters to take custody of an historic relic, PT658, a World-War II motor torpedo boat, and restore it to original operating condition. 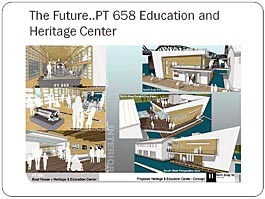 Save The PT Boat, Inc., operates and displays the PT658 in the Pacific Northwest as a recognized historic monument as well as a living memorial to all those who manned, fought, serviced and maintained these small warships during the second world war. 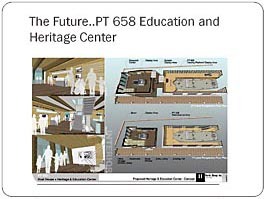 As of 2012 PT658 has also been named to the National Historic Register by the National Park Service. The organization has accomplished quite a lot, with a work force of dedicated hard working volunteers, except when specialty trades are needed. 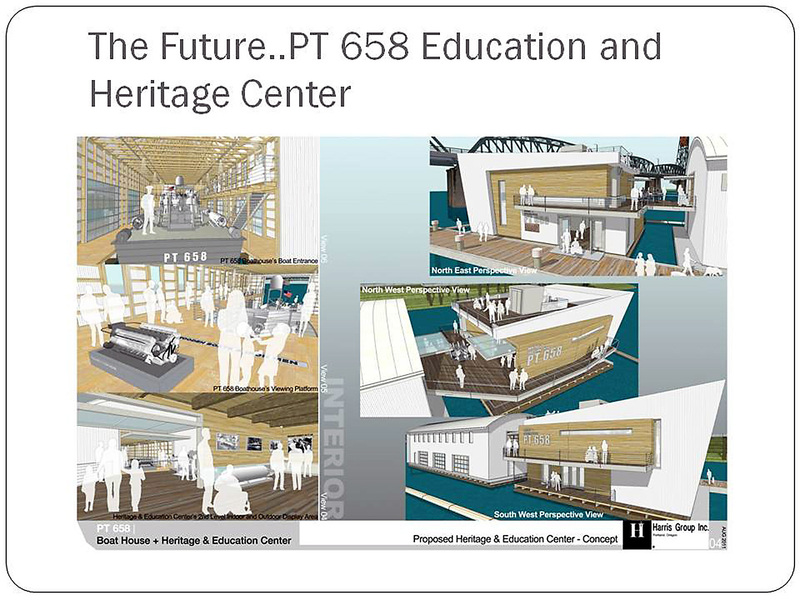 Restoration and maintenance is an on going project, but the organization still needs help for a new Educational/Heritage Museum and as well as for those additional restorations and maintaining the boat and other items. Any and all contributions of funds or equipment are greatly appreciated and are deductible on Federal and Oregon State personal and corporate income tax returns. Our IRS tax number is 93-1162295. Please navigate to our Donations Page to help our organization reach its goals and support the preservation of this historical monument. Contact information . . . .
PT658 TOUR INFORMATION . . .
Limited tours of museum and outside of boat in cradle on barge. 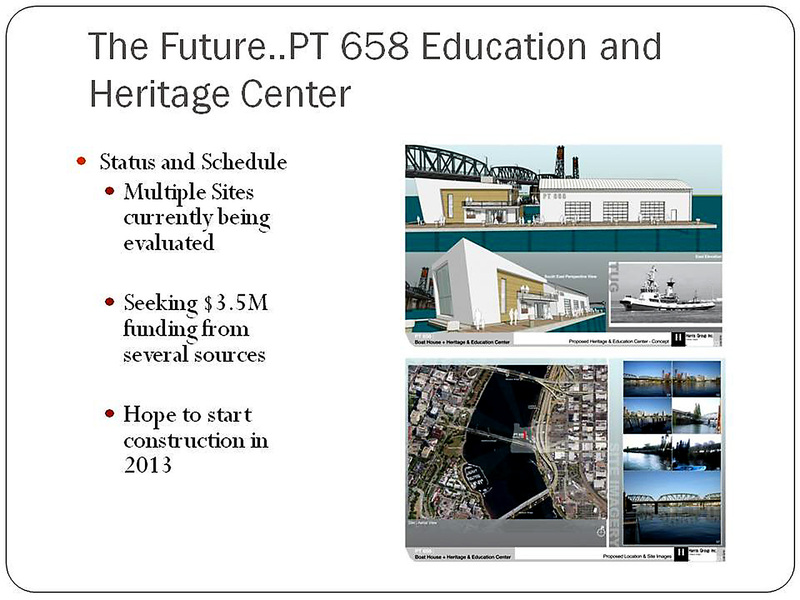 Location of the boathouse and boat is pier 307 at Vigor Shipyard, Swan Island, Portland, Oregon. Entry is thru a locked gate 18 opposite Peterbilt (@ 5555 N. Lagoon Ave). Normal tour times are between the hours of 9am and 3pm on Monday, Thursday and Saturdays. Advance contact is required on Saturdays and is recommended but not required on weekdays. 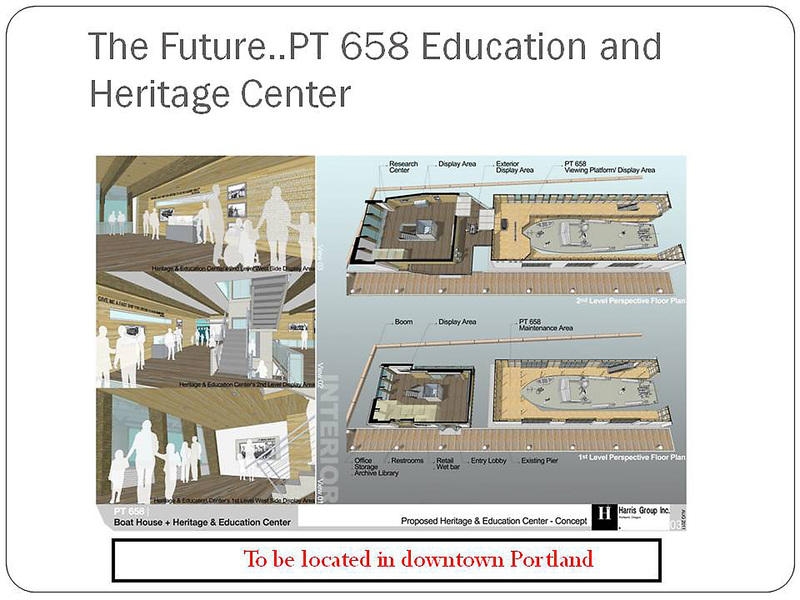 Contact us via email: ptboat658@gmail.com or by phone (503) 286-3083. Normal time for a tour is about 2 hours (1 pm or earlier arrival requested). Donations are requested, but not required. Advance notice of two weeks is required for tours larger than 10 people. The tour consists of up close look at various parts of boat and the boathouse museum. Items available from 'Ships Store' are also available for purchase. E-NEWSLETTER SIGNUP . . . PHYSICAL LOCATION OF PT658 . . . The boat is located at Vigor Inc. gate 18 (across from Peterbilt truck service center at 5555 N. Lagoon Ave.), Swan Island, Portland, Oregon.